Over the next two to three years, the EU will become more deeply integrated. This development will occur due to the demand made by Europeans to solve some common and mutual issues together. 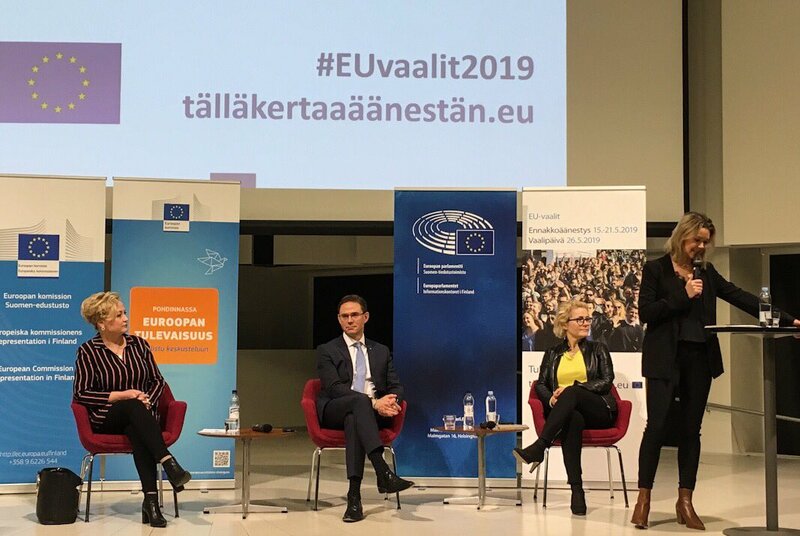 Vice-President Jyrki Katainen, MEPs Miapetra Kumpula-Natri (S&D) and Elsi Katainen (ALDE) discussed the Future of the EU, European Elections and what kind of internal and external threats the EU is facing in a Citizens’ Dialogue held in Tampere. At the start of the Dialogue, participants were asked to vote on whether they felt that their voice was heard in the EU. A majority of 60% answered yes, while 30% felt it was not and 10% said they did not know. The ensuing discussion turned to topics such as Europe’s identity and youth participation. One participant said that for many citizens Europe is “an idea”, not just the institutions alone. “Young people support the idea but may be afraid of the politics”, he said, adding that youngsters are generally passive in politics, not just in EU politics. On the subject of European elections, one participant said that it was wrong to tell a particular audience to vote because “the non-voters are somewhere else”, and asked how the EU could reach out to the generally non-active part of the society. Another participant asked what the role of national political parties would be in regards to the European elections. “It seems that they do not invest in the European elections as much as they invest in the national elections”, she said. On this same subject, one participant mentioned that the Finnish National Broadcaster had studied what topics interest young people the most and had identified climate and wellbeing but also culture. “However, culture is omitted in the political discourse and elections polls. How can we boost the cultural cooperation?” he asked. The discussion continued on the topic of EU defence, with participants wanting to know what the future of this policy is and the relation between the EU and NATO. The debate ended with another voting question. This time, participants were asked if the event had improved their knowledge on the EU, with an impressive 100% confirming that it had.